Of the various explanations how The Simpsons went down the wrong path as it approached the end of its first decade, the phenomenon of “Jerkass Homer” is one of the more popular theories. Jerkass Homer is a term coined by fans for the show’s tendency to push Homer’s accepted levels of laziness and selfishness into unacceptable territory. Homer stubbornly pursuing his goals is nothing new, being a key part of Simpsons narrative as far back as season one’s “There’s No Disgrace Like Home,” but those early seasons paired it with human motivations and frustrations. As the show aged, the writers more frequently lost the ability to strike that balance, milking his idiocy for an easy laugh. The blame for this trend is largely directed toward Mike Scully, who as Erik mentioned last week, took over the show from Bill Oakley and Josh Weinstein after season eight. Scully’s tenure as showrunner is a point of contention for many Simpsons fans, characterized as an era where the show became more cartoonish and mean-spirited in comparison to the Al Jean and Mike Reiss-era depth or David Mirkin-era surreality. It’s unfair to assign blame wholly to one person—any show that makes it to nine seasons will suffer from idea fatigue—but Scully’s track record in writing episodes like “Lisa On Ice” is evidence of a less sympathetic approach to Homer that would grow as time went along. “The Cartridge Family” is the first episode Scully produced as showrunner—though the fifth to air due to holdovers from prior seasons—and it’s an episode that casts the Simpson patriarch in a fairly awful light. 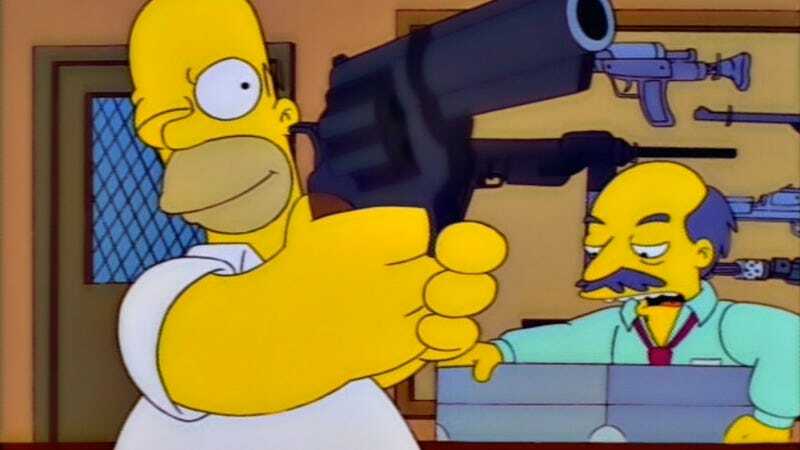 Following a riot that stems from the sheer length of time it takes anything to happen in a soccer game between Mexico and Portugal, Homer decides that he needs to protect his family, and after turning down a $500 offer to seal off the house in bulletproof Lucite decides the best way to protect the home is with the deadliest gun possible. (Aisle six, next to the sympathy cards.) Proximity to the weapon leaves him drunk with power, and he eagerly scoops up every extra the clerk offers him. Again, this isn’t the first time that Homer’s gone overboard in pursuit of a bad decision, but the degree to which he embraces the wrongness of said decision is startling. His use of it is instantly reckless as he introduces it to Marge by pointing it in her face, and the minute anyone tries arguing with him about it, he shows a complete disregard for their feelings. “If you still don’t think guns are great, we’ll argue some more,” and “For once in your life, be fair!” are amongst his more popular arguments, along with the dangers of the King of England. It’s not even a stubborn adherence to defending his family, or even the unique logic that drives many of Homer’s more insane schemes, it’s that he transforms into a child with a new toy who whines the minute someone tries to take it away. A large part of what makes Homer’s behavior so uncomfortable to watch here also has to do with watching “The Cartridge Family” in 2015. On the commentary track Scully and the creative team talk about certain moments that the censors were leery about—the aforementioned introduction of the gun to Marge or Bart and Milhouse playing William Tell, and those moments are ten times more uncomfortable to watch in our modern era where a mass shooting is a monthly occurrence. (Icing on the awkwardness cake: the Confederate flag hanging in Bloodbath and Beyond.) 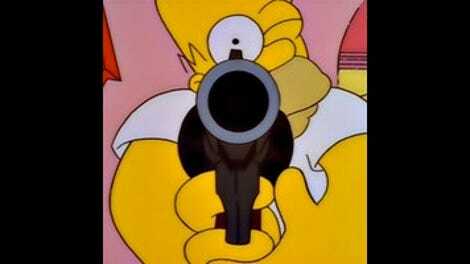 Homer’s embrace of more cartoonish behaviors at the same time that the episode is leaning into a serious topic strikes an odd dichotomy—not that it would be better as a Very Special Episode about the dangers of gun ownership, but its flippancy about the subject has problematic elements. And as with so many episodes of The Simpsons, “The Cartridge Family” succeeds thanks to the rock-solid foundation that is a John Swartzwelder script. As deplorable as Homer’s behavior is here, the word choices in how he argues his flawed arguments create instantly brilliant punchlines, with “But Marge, I swear to you, I never thought you’d find out!” being the best of the lot. The aforementioned line runner about the King of England pays off in terrific fashion in the third act, and the constant deployment of “Vote Quimby!” creates yet another entry in the instant classic all-purpose Simpsons saying. Swartzwelder also gives “The Cartridge Family” two brilliant visual gags, first when Homer’s interminable waiting period for a gun plays out as a montage of potential targets (set to Tom Petty’s “The Waiting”), and then in a brief flight of fancy when Homer imagines how robbing the Kwik-E-Mart would change his life. On its own, “The Cartridge Family” is a more than cromulent episode of The Simpsons: the jokes land with reliable efficiency, every member of the family gets a great moment, and it manages to find a way to satirize both sides of a debate. But it’s also an episode that’s emblematic of some of the more worrisome trends that will continue to dog the show, less relatable behavior by the family patriarch and a broader approach to issues than the episodes that came before. Homer may largely find his way out of the Jerkass groove by the end, but it’s a groove that will be easier and easier to fall into as The Simpsons continues to approach its tenth birthday. The most interesting part of the commentary track for this episode is a moment where, as Groening and Scully discuss how Swartzwelder has never recorded one of these before, allegedly call and get him on the phone for a minute. Given that the call ends with “It’s too bad this really isn’t John Swartzwelder,” you can draw your own conclusions on its efficacy. Interesting choice to have Dr. Hibbert choking Dr. Nick during the soccer riot. The Sleep-Eazy Motel: where TVs, beds, and Bibles are all coin-operated. Next time: Joe Namath knows you’ll have a lot of fun reading our review of “Bart Star.” But, there’s nothing funny about vapor lock. It’s the third most common cause of stalling. So please, take care of your car and get it checked. He’s Joe Namath. Good night!